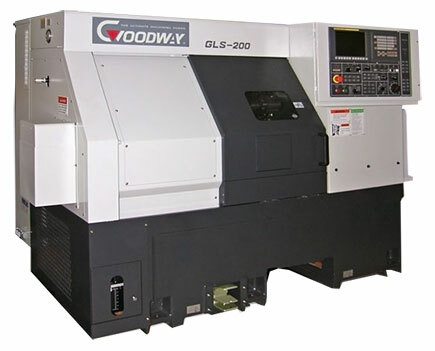 Packed with industry leading technology and top quality components, the GOODWAY GLS series turning centers combine power, strength, and speed to bring you The Ultimate Machining Power®. These high speed machines will easily accomplish the demanding turning applications of today and tomorrow. Furthermore, with available live tooling, C-axis, and Y-axis capabilities; milling, turning applications may be completed in one single machine. 30° slant-bed design provides smooth chip disposal and easier operator access. Stainless steel way covers and special steel wipers molded with industrial strength rubber are used for durability. The auto lubrication system delivers metered amounts of lubrication to the slide ways, ball screws, and vital components. Distribution is automatically shut off during idling to prevent waste. Y-axis models perform virtually the same way as machining centers equipped with 4th-axis rotary tables, but with the benefit of built-in turning capability. The X, Y, Z axes are like that of a machining center, while the C-axis acts as the 4-axis. This configuration replaces a turning center and machining center equipped with 4th-axis with one machine, thus, saving money, time, floor space, manpower and fixture costs, while reducing accuracy lost by eliminating the part from being moved to another machine. Live tooling and C-axis control capabilities on the GLS series allows the machine to perform multiple tasks on a work piece, such as turning, milling, drilling and tapping. This eliminates manpower and cycle time, while reducing accuracy lost, which will occur if the part is moved from machine to machine.